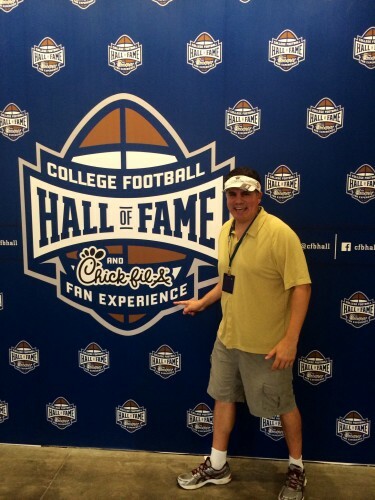 I moved Sports Techie HQ from Seattle to Atlanta two months ago and was invited last month to attend the College Football Hall of Fame 2014 grand opening on August 23 as a member of the media, thanks to Jackson Spalding, and Traci Messier. It took 4 years of design, 18 months of construction and $66.5 million to finish what is considered to be the benchmark museum for sport, drawing a projected 500,000 to over 1 million fans annually to this diverse and football inspired city my family now lives in. Whether you are a reader or follower of the Sports Techie community blog or not, this new facility is full of interactive and digital technology focused on NCAA college footballs 767 teams that will keep you entertained and coming back for more tailored and updated content. I chatted with Stephen Platenberg, Director of Productions, Cortina Productions, about the Hall multimedia software assets they designed and installed. I also had a revealing Hall Q&A with Stark RFID, Vice President of Sales, Jack Tyson, one of my LinkedIn contacts, about their tech used to personalize the Hall’s fan experience. The Halls’ goal was to redefine what a Hall of Fame can be and thanks to the team of designers, vendors and sponsors, they certainly did it. The CFBHall was relocated from South Bend, Indiana, to downtown Atlanta on Marietta Street— adding a complimentary component to the Georgia World Congress Center, a must-see sports and entertainment district near the Georgia Dome. The economic impact of the self-supporting College Football Hall of Fame is a projected $11.8 million in taxable sales each year with an additional annual economic impact of $12.7 million to the state of Georgia. “We are thrilled that our Grand Opening is finally here and cannot wait to share this special day with college football fans across the country,” said John Stephenson, president and CEO of the College Football Hall of Fame. I spoke briefly with John and commended him on the facility; his grand opening speech and the fact that on the super-hot and humid day, he did not visible perspire in his dapper looking suit. No question, this Hall has plenty of engaging and interactive opportunities. The beautiful venue covers 94,000 square feet and includes 50,000 sq. feet of exhibit space and a 45-yard real indoor football field. The state-of-the-art building has historic and contemporary artifacts you cannot see anywhere else. The Atlanta Hall Management designer, Gallagher & Associates, and multimedia producers Cortina Productions and Obscura Digital, coordinated with History Associates for the collection, intended use, and licensing of media assets. History Associates provided the research and acquisition of images, film footage, and other media properties. Because of this effort, the Hall enshrined significant coaches and players, in addition to 90 top-tier and 178 second-tier schools. “The state-of-the-art interactives required a substantial collection of visuals, videos, and iconic images that span the history of college football.” Dr. James Lide, of History Associates. 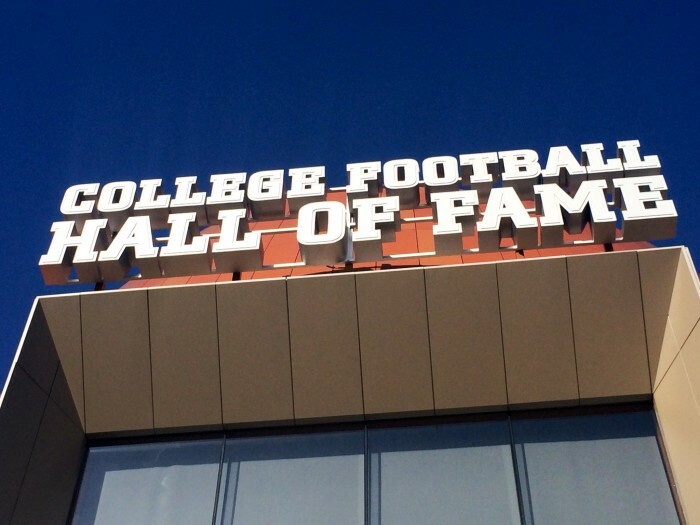 The new Hall of Fame highlights the stories and accomplishments of the schools, players, and coaches who epitomize excellence in college football. 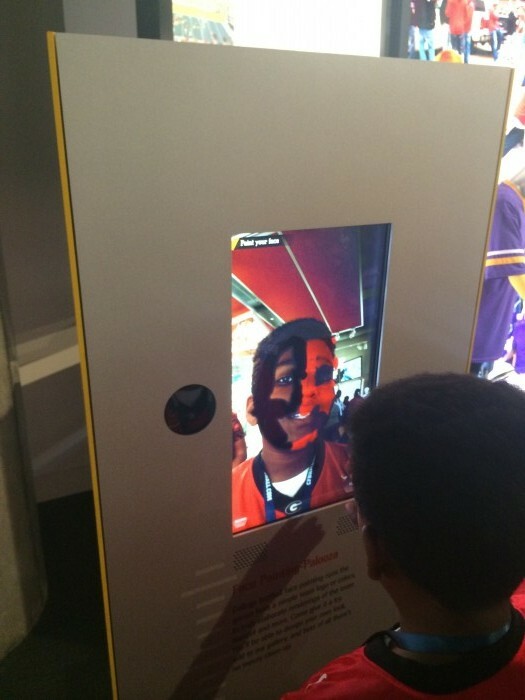 It also includes 10 immersive displays where visitors can select images and video from their favorite school. The 150 total interactive multimedia displays and screens will keep you entertained for hours if not days. Watching the youth-driven activities was as much fun as reviewing all the sports tech. The theater features an ultra-high-definition 4K film that is not only pleasing to the eye but has riveting content. Add in the meeting facilities that can host up to 1,200 people and private event spaces, and you begin to understand how special this place is for all. College Football Hall of Fame Opening Ultimate Tailgate. The festivities at the Centennial Olympic Park District on Marietta Street in downtown Atlanta during the @CFBHall and Chick-fil-A Fan Experience included Atlanta Mayor Kasim Reed officiating the family-friendly “Ultimate Tailgate” opening. The ESPN College GameDay bus was a popular attraction for picture taking opportunities. Kids had a free football clinic hosted by Kids & Pros, where they learned techniques from the Pros, while developing character and skills through athletics. There was a live broadcast from 680 The Fan and music by a DJ. The Clark Atlanta drum line and children’s activities were happening. Everyone enjoyed all the sponsored games, giveaways and prizes by AT&T, Chick-fil-A, Coca-Cola, Kia Motors, Regions Bank, Southwest Airlines, Sporturf, The Home Depot and Under Armour. Other sponsors include, Chick-fil-A Peach Bowl, Georgia Pacific, Georgia Power Foundation, Invest Atlanta, Omni Hotel at CNN Center, and Piedmont Healthcare. Georgia Tech University and other local cheerleaders cheered loud and proud while engaging college mascots (including the Hall’s new mascot, “Fumbles”) made the celebration a resounding success. But the reason everyone showed up in force was to visit the country’s premier sports museum venue full of the CFBHoF attractions, most of it sports tech driven. College Football Hall of Famers in attendance included, Steve Bartkowski, Kevin Butler, Charlie Flowers, Rich Glover, Joe Hamilton, Randy Rhino, Freddie Scott, Art Shell, Bill Stanfill, and the legendary Charley Trippi, along with a few other well-known surprise guests like Bill Curry, who I recorded with my iPhone delivering the opening prayer and later met for a special one-on-one chat. Start the tour off with your All-Access Pass and get ready for something new on every visit to the College Football Hall of Fame and Chick-fil-A Fan Experience. Log in to your All-Access Pass account here and look back at everything you’ve experienced at the Hall this season, and make plans for new experiences at your next visit. AT&T Game Time: From the rivalries that make the game great to the split-second decisions that engrave moments into college football history, this gallery explores the intensity, passion and fun surrounding the game. 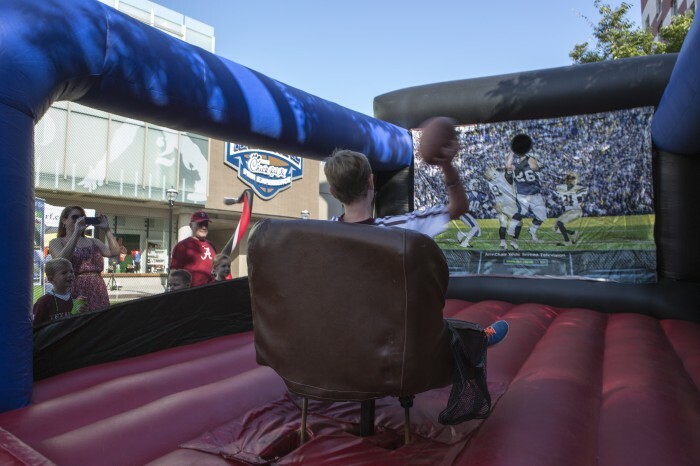 A 40-yard replica football field where guests can try their hand at the Chick-fil-A Peach Bowl Skill Zone. Game Day Theater: Treats guests to an ultra-high definition, 4K feature film, “The Game of Your Life”. Coca-Cola Fan’s Game Day: Chronicles what it’s like to experience the excitement of a college football game from the perspective of the game’s biggest fans, highlighting tailgating, digital face painting, bands, mascots, fight songs, cheerleading and many other long-standing and newer traditions. Kia Building a Champion: This gallery goes beyond the game day field to show the sacrifices and commitment made by today’s student-athletes and college coaches, engage with halftime speeches and a Q & A with current players. The 1905 playbook of John Heisman is there for a look back at this game-planning pioneer, a timeline matches iconic college football moments with American history, finally, the opportunity to learn what being a student-athlete is all about. AT&T Game Time: From the rivalries that make the game great to the split-second decisions that engrave moments into college football history, this gallery explores the intensity, passion and fun surrounding the game. Visitors can call one of college football’s most memorable from the broadcast booth. Fans can also relive the top moment’s college football history, take a 360 degree motion video tour of stadiums, and guide their own college football program on the march to a National championship via a 10-minute interactive exhibit. Chick-fil-A and National Football Foundation Building Leaders: Pays tribute to those who have achieved accolades on the field and have gone on to make a difference off of it, emphasizing the mission and programs of the NFF, and their positive influence since 1947, in addition fans will find out about major awards and the compelling stories of players who have continued into leadership roles in business, government and charity because of the impact of college football. College Football Hall of Fame (3rd Floor): Captures the stories and accomplishments of the players who broke records and won our hearts, cementing their legacy in a one-of-a-kind experience that pays homage to the tradition and heritage of the game using busts, portraits and static photos, plus augmented reality 360 degree views, and the ability to record messages and make pledges. 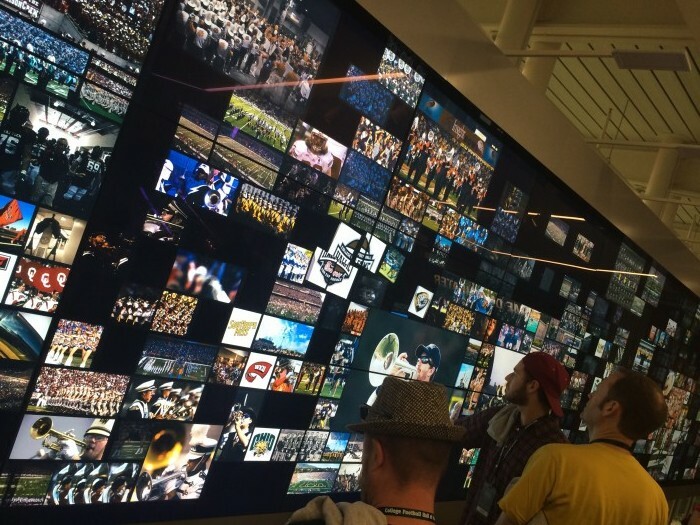 Whether you are a reader or follower of the Sports Techie community blog or not, this new facility is full of interactive and digital technology focused on college footballs 767 teams that will keep you entertained and coming back for more tailored and updated content. Cortina Productions in the Washington D.C. area, is one of the leading media design, video and interaction companies with a client and partner list that includes Sports Techie topics we love such as, the San Francisco 49ers Levi’s Stadium museum digital media, the Naismith Memorial Basketball Hall of Fame, the Muhammad Ali Center, Driving American – The Henry Ford, Monterey Bay Aquarium – Ocean’s Edge, NBC Olympics, Baseball Hall of Fame, PBS, Smithsonian National Zoo App, and the Kentucky Derby Museum 2010 Renovation. They use art as their lens, stories to drive their approach and technology as their tool. After speaking with Platenberg, it is easy to understand why the Hall selected Cortina Productions for their ability to tell a fun and inspiring story surrounding physical artifacts, while sharing the greatest of subject matter like the greatness of College Football for the Hall of Fame, and the NFL for the 49ers Hall of Fame, using digital assets. Cortina technology operates 150 screens, 50 interactive exhibits, bios, formatted videos and engaging slide shows, resulting in interactive Hall exhibits with tremendous stay time, that according to Platenberg, “Set the Industry standard other museums and hall of fames will look to for inspiration, in addition to the new museum model that changes every day with fresh and engaging, personalized sports content”. Their 8 in-house programmers will supply updates and big data tweaks as needed. ESPN College GameDay Built By The Home Depot. Each visitor receives a personalized credential tagged with RFID technology created by Stark RFID that is part of the museum admission price and also a novel souvenir keepsake. The Hall wanted the interactive fan experience to be a custom walkthrough for each person so Alien Technology ALN-9654 “G” RFID inlay was chosen because it encodes a unique ID number that matches the eight numbers printed on the back side of each credential allowing the Hall the opportunity to encode information about each visitor ensuring personalized fan experiences each new visit. By implementing the high-frequency (UHF) RFID system to collect data, CFBHoF management is better able to know exact figures of attendance, time spent per exhibit, what displays are most popular, and where potential bottlenecks might be happening so they can make timely corrections. The process is well-thought out, fans register upon entering with personal information including their favorite college football program. After this, the 100 readers in place at entrances, displays and exhibits scan using sophisticated software that compiles data and saves it on six servers. The resulting analytics helps improve the Hall and makes each visit different and even more personal because they know your past viewing habits and likes. The All-Access Pass data is hosted at the web site where it is simple to upload and save videos or pictures of your tour, and then share the unique experience with family and friends using popular social media platforms. 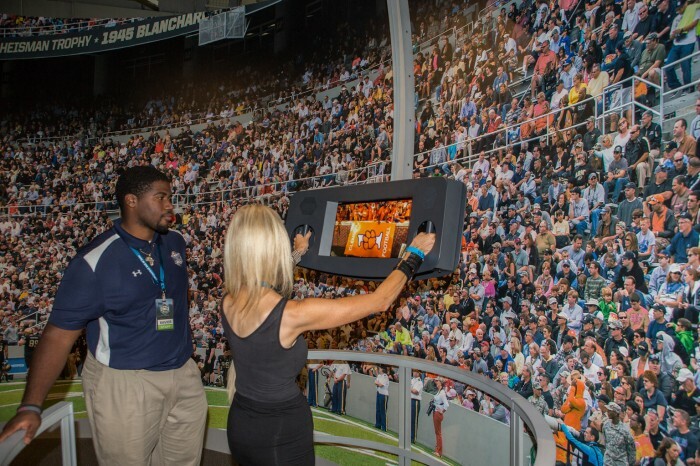 A multi-touch system allows for interaction with content specific to a fan’s favorite college football team. 1. Was the business intelligence requested by the College Football Hall of Fame different than other customers’ requirements, if so, how? Answer – All of our clients have different priorities, but the business intelligence aspect of Stark RFID is very robust, so they usually are seeing real-time information that hasn’t been available to them before. 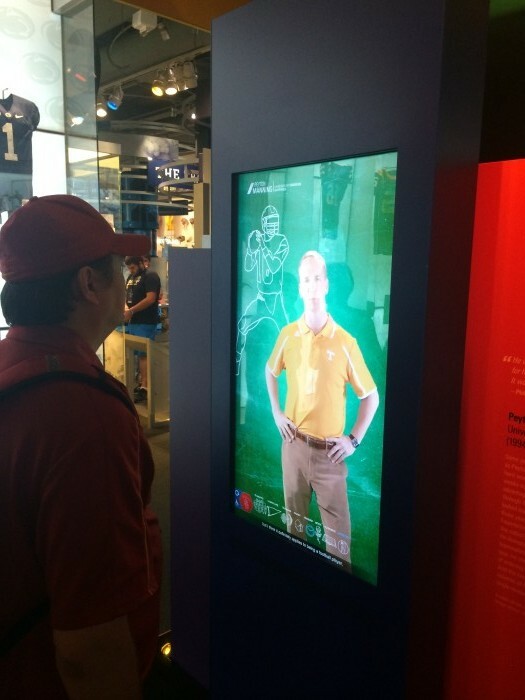 The College Football Hall of Fame is very focused on the fan experience, so they look at all aspects of visits like length of stay, favorite interactives and more. 2. How long did it take for the initial design, product manufacturing and system installation take? Answer – Our involvement was about two years. There were so many creative options being discussed that it was really exciting to be behind the scenes knowing how much fans would enjoy the finished product. Actual installation took us a couple of months as we worked alongside several other companies to install our equipment after interactives were completed. 3. How has the ultra-high frequency (UHF) RFID system operated so far after one week? Answer – The Stark solution has worked great. We had a series of private events prior to the grand opening that allowed everyone (us included) to make adjustments. 4. What are the sports analytics telling you so far about the CFBHall customers, facility traffic and exhibit bottlenecks? Answer – I think that’s really a question for the Hall management. 5. 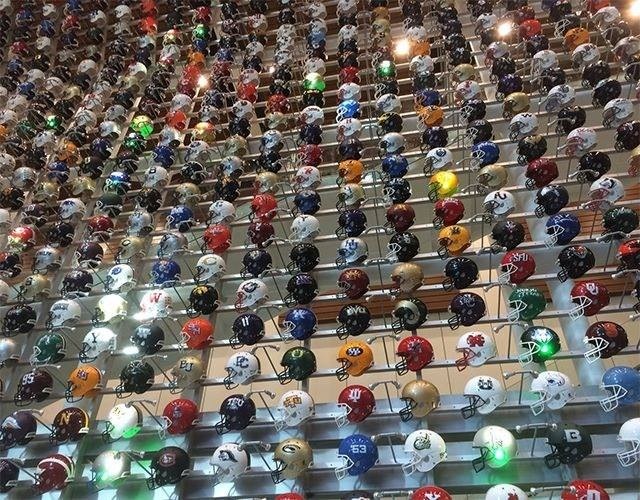 First the Georgia Aquarium and now the College Football Hall of Fame, what kind of sports related properties are you targeting as the next clients for Stark RFID? 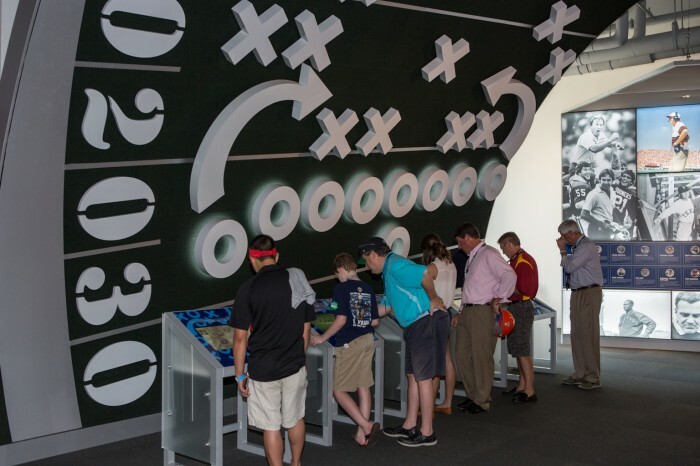 Answer – We see the College Football Hall of Fame as a game changer in the museum, exhibit and hall space. Everyone is encumbered by the square footage of their facility. The Hall’s approach is to deliver as much content as possible digitally, while combining displays with historical artifacts, trophies and treasures. They can also update their content constantly based on games being played each week. Fans will enjoy a new experience every time they visit. 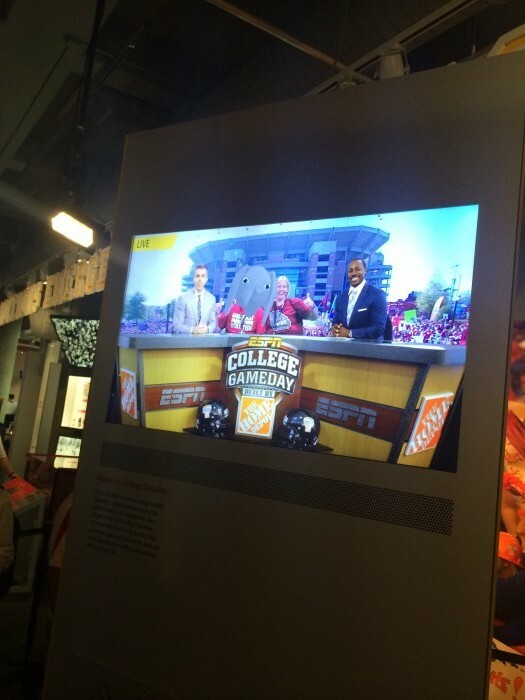 Coca-Cola Fan’s Game Day at the College Football Hall of Fame. The National Football Foundation (NFF) is a not-for-profit educational organization that runs programs designed to use the power of amateur football in developing scholarship, citizenship and athletic achievement in young people. The NFF launched the Hall in 1951 to immortalize the game’s greatest players and coaches for future generations. The NFF partnered with Atlanta Hall Management to relocate and develop the new Hall of Fame in 2009. 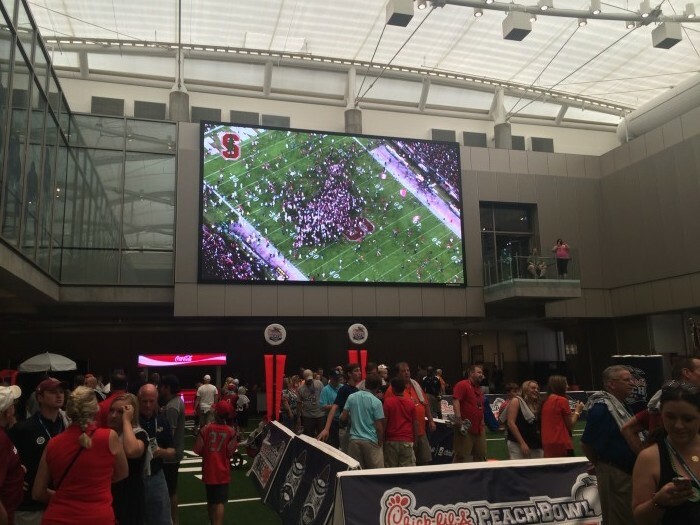 The new College Football Hall of Fame and Chick-fil-A Fan Experience is a 94,256-square-foot attraction located in the heart of Atlanta’s sports, entertainment and tourism district. 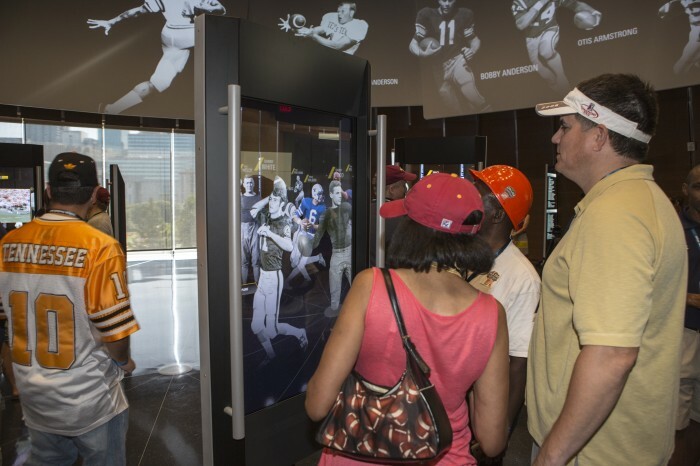 Adjacent to the Georgia World Congress Center and Centennial Olympic Park, the new Hall provides visitors with a highly immersive, interactive, and engaging experience using a blend of historic college football artifacts and state-of-the-art, interactive multimedia exhibits. The National Football Foundation (NFF) launched the Hall in 1951 to stand as one of the nation’s premier sports shrines, immortalizing the game’s greatest players and coaches as positive role models for future generations. Atlanta Hall Management, Inc., partnered with the NFF to construct and operate the new Hall of Fame attraction, which also provides a platform for community outreach, education, and character development initiatives, as well as serves as one of Atlanta’s premier special event spaces. For more information, please visit www.cfbhall.com. Sports Techie, The FC Barcelona Camp Nou Stadium in Spain, fan experience powered by Intel, was a fan-centric, sports tech driven and business bonanza for European soccer fans but the College Football Hall of Fame is hands-down, the best, most interactive and personalized, fan experience not only in America but the world. Bravo to the College Football Hall of Fame, the city of Atlanta and to all the sponsors, vendors and college football institutions for making this so. Some of my favorite teams, coaches and players, and exhibits and sports technology, are showcased in the video clips and images throughout this blog. 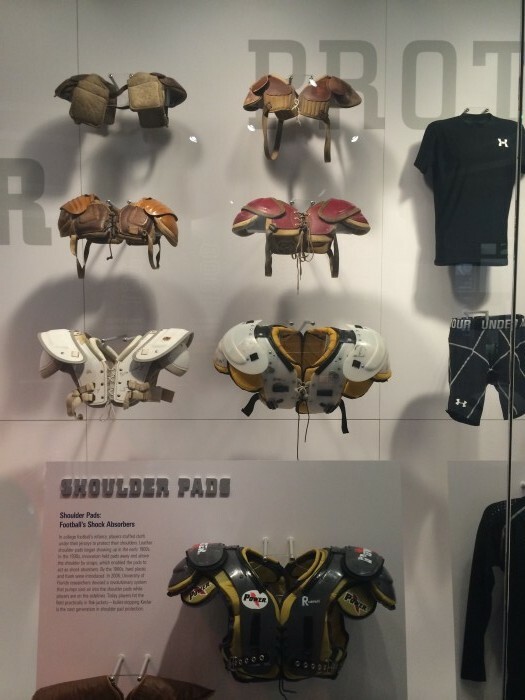 I have blogged for over four years and have touched on football helmet and shoulder pads technology, as well as coaching tools like analytics. I recorded a Vine app video of Mississippi’s quarterback Archie Manning..
Tennessee’s legendary alum Peyton Manning gives advice on how to build a champion. I was born in 1966 in East Lansing when my Dad was a graduate assistant for the Michigan State Spartans who featured All-American Bubba Smith. I was born in 1966 in East Lansing when my Dad was a graduate assistant for the Michigan State Spartans who feature All-American Bubba Smith. 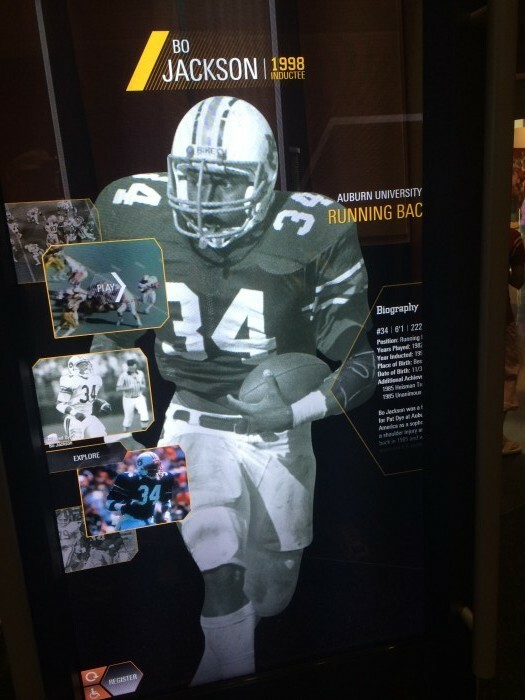 What visit to the Hall would be complete without a visit to the Bo Jackson exhibit, who many fans feel is the greatest college football player ever while at Auburn University. 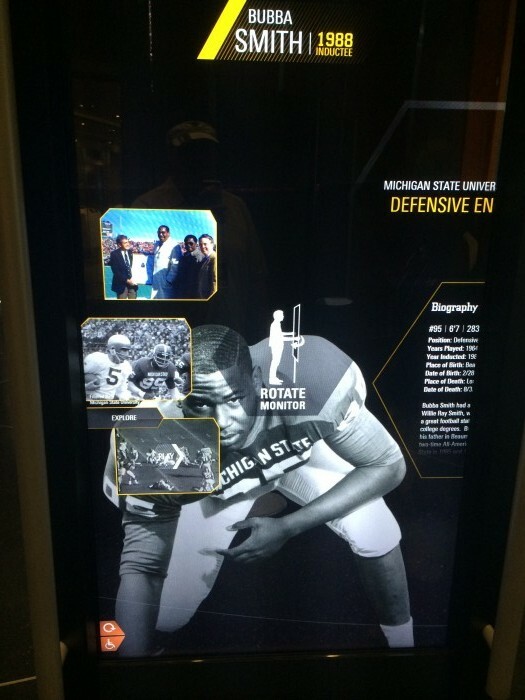 The College Football Hall of Fame has 10 immersive displays where visitors can select images and video from their favorite school. 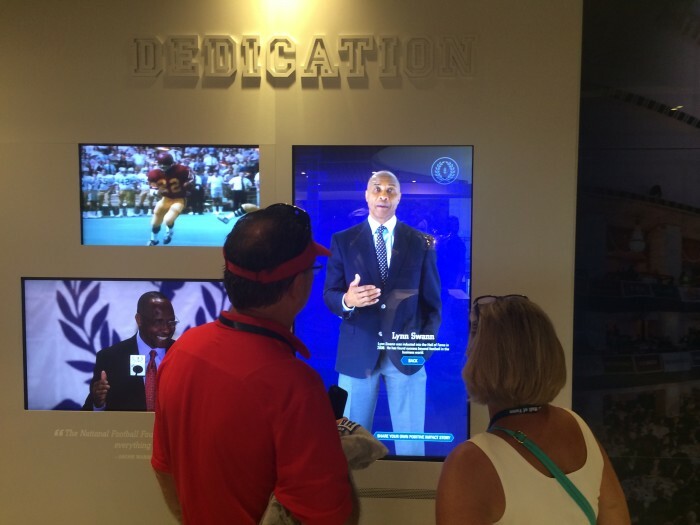 The new College Football Hall of Fame is sports tech-centric, and is a special venue where fans can visit with family and friends while meeting new people, both young and old, who love the game like you do. I (wearing white visor)spent over an hour at the College Football Hall of Fame gallery with like-minded fans who also love the game of football and the pioneering museum.